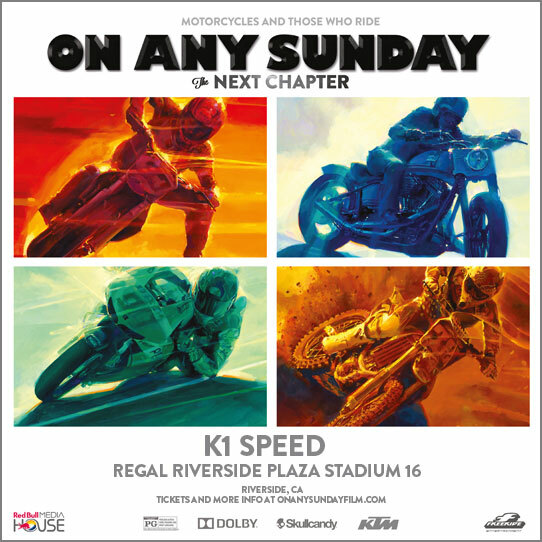 Join K1 Speed as we head to Regal Riverside Plaza Stadium 16 for the 7:45pm screening of On Any Sunday, The Next Chapter on Friday, November 7th! Four decades after the original “On Any Sunday” scored its Academy Award-nomination for Best Documentary Film, “On Any Sunday, The Next Chapter” shows that the passion for riding motorcycles is as strong as ever. Dana Brown directs this modern take on the original, capturing what it means to ride in the United States and abroad. “On Any Sunday, The Next Chapter” is an exploration into the pursuit of excitement, passion and life in the world of motorcycle riding. The film will be in theaters nationwide on November 7.